Look at that! While I was finishing Wednesdays in the Tower, the 48 hours ended. I’m going to write up my finish line post and then take a NAP! And I did it! I actually spent a full 24 hours and 35 minutes out of the last 48 reading and blogging! Okay, 20 minutes were unpacking boxes of books, but that’s still more than 24 hours on officially sanctioned activities. I finished 3 novels — Heart’s Blood, by Juliet Marillier, reread Tuesdays at the Castle, by Jessica Day George, and just this minute Wednesdays in the Tower. I’m a little disappointed in Wednesdays in the Tower. I rather wish I hadn’t reread the first book, or I think I would have liked it more. But the magic of the castle didn’t seem to work the same way — but most of all, the story isn’t finished. It didn’t tie up nicely like in the first book. Anyway, I’ll save it for a review. 13 hours and 55 minutes reading. I read 933 pages, 267 of which were various nonfiction books, the rest of which were the three novels. 2 hours and 25 minutes were spent listening to The Plantagenets by Dan Jones. 2 hours and 15 minutes were spent posting previously-written reviews. 5 hours and 40 minutes were spent writing reviews or blog posts or recording times. Wow! I might actually be able to hit the 24-hour mark in the 48-Hour Book Challenge! Even though I worked. I am now posting this simply to keep myself awake. Once I stop, I need to go straight to bed. But I’ve already done 14 hours and 35 minutes of the challenge! So if I can fit in 9 hours and 25 minutes, even though I’m going to church, I can hit the 24 hour goal. The big question: Can I keep from taking an afternoon nap? 1 hour and 35 minutes posting reviews. 1 hour and 50 minutes listening to an audiobook. I’ve spent 10 minutes unpacking books. I haven’t done any networking so far, except what I did in between customers when working at the library reference today. I learned that my sister Marcy is participating in the Challenge! I have completed three books, though two of those were nonfiction books that I only had the last chapter left to read. I read many, many nonfiction books at a time, rotating piles. I don’t recommend that method to anyone, but it does keep me from getting bored. The third book was Heart’s Blood, by Juliet Marillier, which I also only had to finish. Tonight I’d had enough “productive” time spent. I wanted to have the fun of reading! 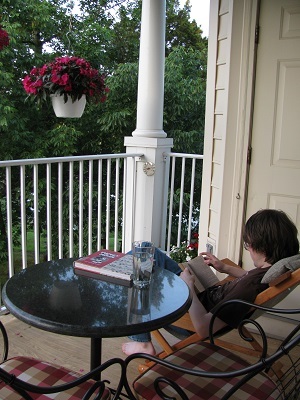 So I went out on my balcony (pictured in the Starting Line post) and finished the book. 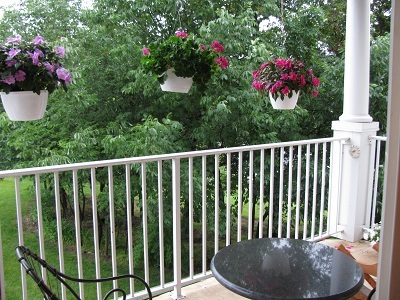 I’m so happy with the balcony! Birds were singing loudly the entire time. On the grass, I watched a squirrel, and later a bunny. It just felt so nice to sit out there enjoying a book. My page total is 369 pages. That doesn’t seem like very much with 7 hours and 45 minutes spent reading, but shuffling around the nonfiction books goes much slower than settling in with fiction. For that matter, the Heart’s Blood pages were long ones. Anyway, I’m really drooping and need to get to bed. Can I do 9 hours of the challenge tomorrow without skipping church? We shall see…. It’s time! Time for the official 48-Hour Book Challenge of 2013! Last week, I did a practice run. Although I got 20 hours in, I didn’t get nearly as much blogging accomplished as I hoped. For that matter, I never get as much done as I hope. A weekend is simply not that long! However, it’s fun to do what I can! Tomorrow I have to work, but I do plan to read during my lunch break and listen to an audiobook in the car. And then when I get home, I’m going to immerse myself in reading. I started at 7:00 pm on Friday, so that means after 7:00 pm on Sunday, I can get to my mundane details like grocery shopping and ironing. Now, I’m hoping to do some good blogging, as well. I currently have a stack of 10 books (one of which I just finished after starting the Challenge) to write reviews for. Now, I also have 48 reviews written but not posted. So I very much want to get several of those posted. And I’m currently especially obsessed with posting the reviews I wrote in 2012. There are 8 of those left. So if the books seem older, that is why! I still have some reviews to post that I wrote when I was on the Cybils panel judging middle grade science fiction and fantasy. 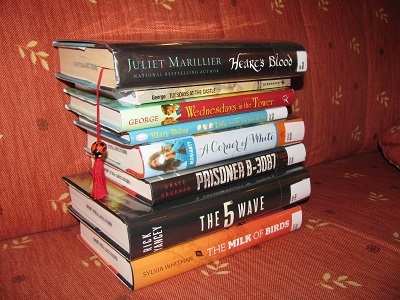 On top is Heart’s Blood, by Juliet Marillier, which I’m about half done with. Does anyone remember my Reading Plan? I’m still following that, sort of — just inserting lots and lots of interruptions. But Heart’s Blood was the “older library book” in the plan. Next up is rereading a book. I was having trouble deciding what to reread when an Amazon package came today! Hooray! Perfect timing! One of the books in the package was Wednesdays in the Tower, by Jessica Day George. So that means the perfect book to reread is Tuesdays at the Castle. And that takes care of the next book in order, a book I own. After those three, the rest of the books are books that Capitol Choices is considering, which I would very much like to have read before our meeting next Friday. We’ll see how I do. But I just finished a Nonfiction book I’d been working on for months, Surviving Survival, by Laurence Gonzales. So I do, eventually, finish them. But that’s enough pictures of clutter and chaos! The fun one to post is the one of where I will spend significant time reading, at least during daylight hours. There you have it! Happy Reading! This past weekend, I held a personal Book and Blogging Blitz, as warm-up for next week’s 48-Hour Book Challenge. One thing I’m learning from these weekend blitzes is how much shorter a weekend is than I think it is. No, I didn’t get caught up on posting reviews. I didn’t make a dent on my stack of picture books to review. I did, however, make a little progress. And I did have fun. One thing that ate some time was totally worth it. 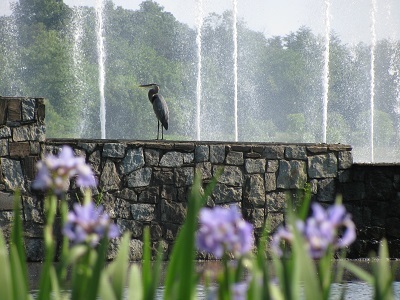 I posted the first time for a long time on Sonderjourneys, after I caught the local egret on camera. Altogether, I spent 20 hours on books and blogging. That was made up of 5 hours and 50 minutes blogging, 8 hours reading, 2 hours 30 minutes listening to an audiobook, 10 minutes networking, 1 hour and 5 minutes unpacking book boxes, and 2 hours 25 minutes posting reviews. I read a total of 518 pages, finishing 3 books. I posted 4 reviews, wrote 2 new reviews, and posted 3 other posts, including Sonderjourneys and Sonderling Sunday. I also unpacked 7 boxes of books. So, no, it didn’t nearly finish the task I’d set myself. But again, I made progress, and I had fun. Going forward, I’m going to keep trying to post at least one review most days, and eventually I’ll get caught up. I’m planning to be choosier about which books I review, and use Goodreads for the ones I’m a little bit less excited about. But it’s hard to set a book aside! I do plan to dive into the 48-Hour Book Challenge next weekend. Yes, I’m working on Saturday and have church on Sunday, but I may be able to move some chores outside the 48-hour window and give some time to books. It’s worth a try! Anyway, I feel like I’m back in the saddle again. 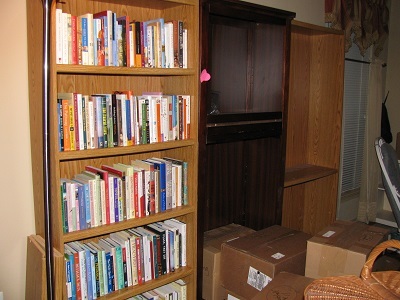 By adding some unpacking into my process, I learned that unpacking one box of books only takes about 5 minutes, so I can add that easily into my daily routine. And I don’t have to stop blogging while I’m unpacking. It will be done some day! Book and Blogging Blitz Begins! 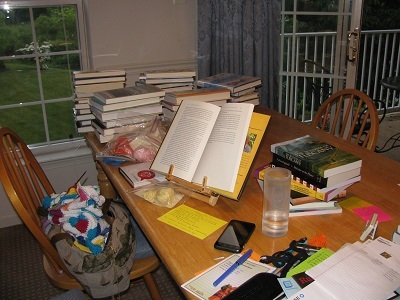 So, when I was doing my Unpack-a-thons, it was partly to get unpacking out of the way before the annual 48-Hour Book Challenge. It’s always at the beginning of June, so I was hoping it would hit this weekend. When I learned it’s going to hit next weekend, when I am scheduled to work both Friday and Saturday, I decided I will have to celebrate this weekend on my own. I got to thinking: I still want to participate in the official event. So why don’t I use this weekend as a sort of warm-up? But I will use my own rules instead of the official rules. For starters, I will count time reading picture books. I have a big stack of picture books I’ve been meaning to review for quite some time now. I will tackle that stack. I also think I’ll make a concession to the unpacking that still needs to be done by unpacking one box of books per hour. Now, with the 48-Hour Book Challenge, it’s a lot more fun if you spend most of the time actually reading. That’s what makes it an indulgence. But the thing I really want to get around to doing is posting reviews. I have reviews still waiting to be posted that I wrote in 2012! And I have that aforementioned stack of picture books. And another of children’s nonfiction. So I’m thinking I’ll focus on writing reviews this weekend, and then for the Actual 48-Hour Book Challenge, with what time I have, I can indulge myself and simply read. I’m thinking I’ll spend the rest of an hour on an item in the rotation, alternating back to the top of the list. (I really want to get that stack of picture books done.) Like this: Novels (which I’ll finish up the first time), picture books, children’s NF, picture books, short fiction, picture books…. Once I finish all the picture books, I’ll cycle back to children’s nonfiction. And so on. 4) Bedtime or naptime reading will be exceptions to the above. I’ll just read a novel until I fall asleep. Other exceptions will be my quiet time in the morning (nonfiction reading) and the aforementioned listening to an audiobook while cooking or ironing. 5) After I’ve gone through all the categories above, like in the 48-Hour Book Challenge, I’ll spend the remainder of an hour visiting other blogs. In that hour, instead of posting a review, I’ll write an update post and a post for one of my series. And at the end I will post all my stats. Now, I admit, it’s much more fun to do this along with others. So this will be my warm-up, to build enthusiasm for participating next week, even though I have to work. I’ve also been hesitant to post more than one or two reviews in a day, since they get buried in a blog. But I’m just going to go for it! I want to get caught up! Of course, what takes me so long to post reviews is that I also post them on my main site, which takes some html fiddling. But at least there, I can highlight ALL of the weekend’s reviews, and the ones at the start of the weekend won’t just get lost on the second page of the blog. So, enough rattling on! This constitutes a blog post, so now I’m going to unpack a box! Let the Blitz begin! On Memorial Day weekend, I held another personal Unpack-a-thon. And though there’s still a long way to go, I think I got things to where I’m happy with unpacking a few boxes each night, and no longer feel that desperate need to clear more floor space so I can think. Best of all, I completely finished the job of unpacking kitchen things. That was difficult — so much involved figuring out where doodads I’d put in drawers should now be stowed, with less drawers and less cupboards. But the job is done! Mind you, I then moved boxes of pictures into the kitchen alcove where they will be out of the way while I unpack everything else. But everything that belongs in the kitchen is now put away! Woo-hoo! Here are the stats: Total time spent was 19 hours. A wicked migraine I woke up with on Sunday was what kept this number down — requiring a long nap Sunday afternoon. But I was happy with how much I was able to do anyway, and the headache did let up, and unpacking was a great distraction. The boxes are broken down into 19 boxes of books unpacked and 15 other boxes. The book boxes are much easier, and that’s what I’ve started focusing on now that I’m doing a little bit each night — progress is faster and more obvious. Those are what I took pictures of after the Unpack-a-thon was done. 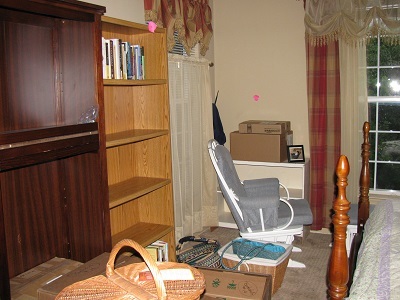 In the living room, I unpacked 10 book boxes, 3 other boxes, and 6 bags or baskets. 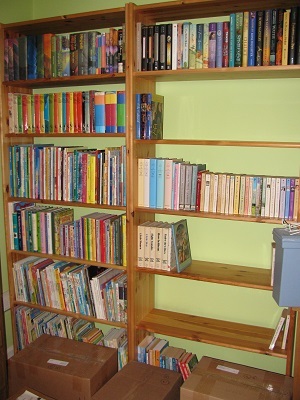 In the office, I finished filling the bookcase of picture books and collections (Harry Potter, The Black Stallion, and Oz) This involved 6 book boxes and 2 other boxes. In the bedroom, I unpacked 3 suitcases. This was difficult, since I had gotten rid of an old falling-apart sweater chest and had to figure out where to put things and what I could get rid of. I also did unpack 3 book boxes and one other box. 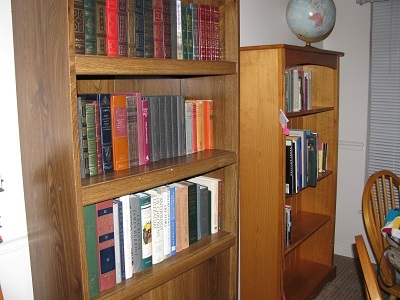 And I put shelves in one bookcase. I credit my son with the lovely excuse to buy a bookcase. 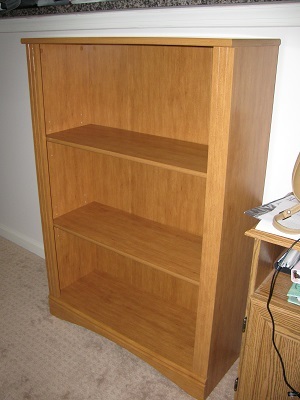 He noticed that my two-shelf bookcase would fit at the foot of his bed and should be able to hold the books he’d brought back from college. 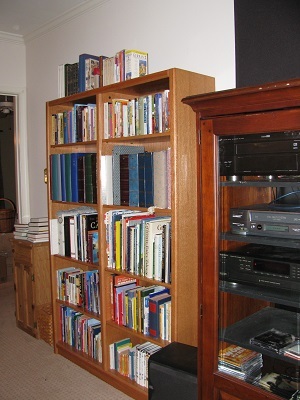 I was annoyed at first, since I’d worked hard to fit all my books on shelves — until I realized I could fit a 3-shelf bookcase where I’d put the 2-shelfer. 🙂 Call him an Enabler. So I still haven’t finished the job, but I’ve had enough of focusing on it for awhile. I’m trying to decide if I will just take it easy next weekend, or if I can find the time to treat myself to a Blog-a-thon and try to catch up on my blog posts. Meanwhile, today at the library, I booktalked our Summer Reading Program in one of the local schools with my co-worker. It was my first booktalks in four years, and I’d completely forgotten how much fun it is to see all those kids’ faces and get to tell them about great books! This made me smile as much as being out there myself! Truly, life is good! Well, that didn’t work out like I hoped it would! Okay, I knew my goals were impossible, but I thought I could make a lot more progress than I did. However, I think I had a mini-stroke last week. I no longer overreact. I no longer head to the Emergency Room, or even call my neurologist. [The very very good news is that I see a specialist at Johns Hopkins this coming Friday. This will give me something more to tell him!] I suspect the mini-stroke was so small, it would not show up on an MRI. None of the others did! (But one I felt, and one caused permanent double vision if I look in certain directions.) However, all of them leave me feeling weak and dizzy if I walk around. I get better after a couple weeks, and I was doing great at PLA (Thank you, God!). But this week I had another setback, and the feeling is continuing through this weekend. I feel a lot more annoyed with it on my days off than I do on work days, I’m a bit ashamed to say! So, I thought I could spend several hours on catching up on reviews. But I spent a big part of both days napping. I did get in a game of Dominion with my son both days, but that was worth it! I won’t be able to do that later in the week, when he’s at his Dad’s. And I do have two more days off, but I will definitely need to do some of the chores and errands I put off, ostensibly for Bloggiesta. However! All that said, one of the best things about Bloggiesta, honestly, was reading this post at Chachic’s Book Nook. Like Chachic, my blog is meant to be My Happy Place. This is for fun! So — though I only got 3 reviews written, I have put many more books than that back in my bag to return to the library. I do not need to say, “Here’s a good book,” unless I have a bit more to say about it than that. And I was nicely reminded to keep this fun. Other things I did: I did make it to part of two of the Twitter parties. I posted a review both days, and another blog entry both days, and a Sonderquotes entry both days, and a Sonderblessings entry today. I attempted to upgrade my blogs, but ran into trouble with the needed database upgrade. I will take that up with Yahoo some time when I’m not expecting commenters, so it won’t be so bad if the whole site is down for awhile. I did not achieve the commenting mini-challenge — only making 6 comments. But I do plan to go back to the Bloggiesta list to visit blogs in the future. The other mini-challenges also didn’t get done, but again, the instructions stay there, so I can always go back to them when I’m feeling better. Summing up, I still have piles of To-Be-Reviewed books. But they are smaller, and I do think my attitude toward them lightened up. I remembered how much fun this is! Oh, and I found a whole bunch of delightful bloggers to follow on Twitter! That’s going to add some fun to my days long into the future. Will I do Bloggiesta again? Absolutely!